When you hit the road for a 4WD adventure or out into the wilderness for a camping trip, it's important to be prepared for whatever the road might throw at you. That's why having a Thunder Battery Charger on hand is a must for any driver who wants to be ready for anything. Any driver knows that a portable car battery charger can make the difference between a great trip and a total disaster – so pop one of Thunder’s reliable chargers in the back of your 4WD! What Makes Thunder Products So Good? Thunder’s products are designed to have your back whenever you’re out adventuring – without breaking your budget! Their products emphasise affordable reliability, and are the ideal companion for anyone, from new 4WD enthusiasts heading out on their first trips to seasoned veterans with thousands of treks under their belt. These versatile chargers are compatible with a massive range of batteries, including GEL, AGM, Calcium, and Deep Cycle batteries – meaning that even if you have a couple of different vehicles, you can travel with peace of mind safely stowed away in the boot. All Thunder battery chargers feature a raft of safety features such as over-charge, over-temperature, and short circuit protection. Plus, the handy LED display ensures you know your battery capacity at all times. Sparesbox is excited to be partnering with Thunder to offer you a range of indispensable battery chargers. Packed full of essential and ingenious features, these car battery chargers ensure that you never get stuck in the middle of nowhere with a flat battery. 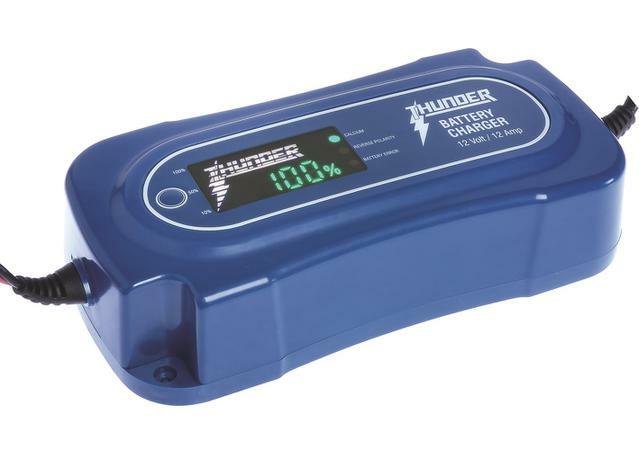 Their 4WD and car battery chargers are available in a range of amperage, from the Thunder Battery Charger 12V 4A TDR02104 all the way up to the Thunder Battery Charger 12V 30A.